The Vietnam War, also known as the Second Indochina War, the Vietnam Conflict, and, in Vietnam, the American War, occurred from 1959 to April 30, 1975. It was the longest war America has ever been involved in and it was also the most unpopular American war. It is the only war that the United States has ever lost. Once North Vietnam forced the French colonial leadership out of Vietnam territory, the north part of Vietnam became communist; however, South Vietnam stayed an anti-communist nation and fought to preserve a Vietnam more closely aligned with the West. The North and South parts of Vietnam were divided by the 17th parallel. The Soviet Union and China supplied North Vietnam while America supplied weapons and soldiers for South Vietnam. One of the military strategies used during the Vietnam War was called Search and Destroy operations. Soldiers were sent to find the enemy and then destroy them. Once the enemy was destroyed, the soldiers immediately left the scene. Search and destroy missions involved sending out platoons, companies, or larger detachments of US troops from a certain position to locate and destroy Vietcong and NVA units in the countryside. These missions most commonly involved hiking out into the “boonies” and setting an ambush in the brush, near a suspected VC trail. Other offensive military strategies were used such as the Tet Offensive. On January 30, 1968, North Vietnam launched the Tet Offensive. Tet is a word that means the Vietnamese New Year. During this festival, North Vietnam launched a major surprise attack on South Vietnam that hit 36 major cities and towns. Both sides suffered heavy casualties. It showed that the war was not going to end soon and weakened the US public support of the war. The US began to then reduce the number of troops in Vietnam. In 1973, the US withdrew their forces; two years later South Vietnam surrendered to North Vietnam and the country was united under communism. More than 3 million people were killed during the conflict, including roughly 58,000 Americans. The war estimated to cost around 200 billion dollars. 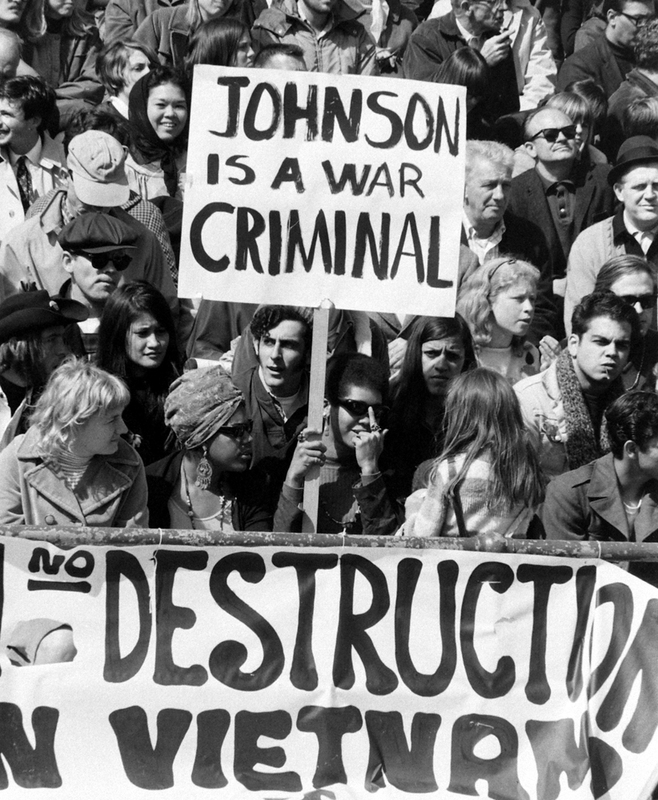 Rallies and teach-ins were a few ways that Americans at home resisted the war. People lost pride and self-confidence in the United States and lost a little faith in our government. This war is significant because it showed how the US should not handle foreign conflicts in the future. We cannot always succeed when trying to help out other countries and this war helped us to learn that. LINK TO OUR VIDEO: http://www.youtube.com/watch?v=WkvjixMBOuQ&edufilter=Db24N54Eu_vpe4P65Iz5Fa&safe=active ONLY WATCH FIRST MINUTE OF VIDEO. I thought your post was very informative. I was unaware of the cost of this war and that it was the longest war the US ever fought in. I knew it didn’t have a lot of support, but this post helped me understand why. The only criticism I have is that you didn’t address what the soldiers, especially US ones, went through. However, the post did contain a lot of relevant information and the pictures addressed a variety of your points rather than just one. Great job! The post was well rounded and all around fantastic. Your pictures were very pertinent to the information and showed the struggle of the times. I’m also glad you told us only the information we needed and not the info we didn’t need. The only things I didn’t like were that you could not tell where you’re now what so what paragraphs where and you could have described the daily life of soldiers and all people effected by the war. Overall it was a solid description of the Vietnam war. I thought your paraphraph was very clear and easy to understand throughout and I liked how you went into great detail of the events. I think it was a little unclear of your now what and so what paragraphs. I wish your video had been easier to get to and have it just on your page instead of a link. All together I think your post was interesting. The main thing I took away from your post was how many soldiers were killed in the war and how much US money was spent. I also think it’s so sad how Americans lost their pride and faith in the government. Overall I thought your blog was very informative and I learned a lot from it. I did not realize how long the Vietnam War lasted and how they used the millitary strategy, Search and Destroy, throughout the war. Also I did not know what the Tet Offensive was but I learned that through reading this blog. I liked the pictures you all used, I thought the pictures described the time very well. The only improvement I would recommend it describe the soldiers more and what the US soldiers went through. Overall I think this blog was very well writen. I like how this is easy to understand how things happen and the order of the events. I think that it is important to learn about the Vietnam War and how it effected America. I like that you included all the important parts of the war and you did not include anything unimportant. I did not how it was too short, I feel like there could have been more detail. I don’t think that there is a lot of things that need to be fixed, this is a good post about the Vietnam War. Overall the post was well organized and informed. It did a good job at describing how the war started and the Search and Destroy strategy. It also describe what the Tet Offensive was well, but it would have benefited from more in depth details of what happened during the offensive and what effect the results had. Also, it would help if you wrote more about other strategies used in the during the war. As well as, some more information on what was happening back in the United States during the war. The main thing I took away was that this war set the precedent for how to handle wars to come.